It was back in April 20, 2014 when several travel companies, began noticing an increase in the people visiting Denver, Colorado. At the moment, there were still speculation as to why this was happening, but after realizing that marijuana had become legal in this State, the reason was more than obvious. Today, experts are speculating that marijuana tourism is a very promising industry and that it is barely in its developing stages. It is still unsure how cannabis will be regulated in the United States and across the world, but it is obvious that it will happen sooner than later and that it will be one of the strongest industries as well. Online travel companies, also saw an increment on the people travelling to Denver, Colorado this year and this is only more proof that cannabis tourism is a real thing these days. The number of people travelling to Washington, also increased during both April 2014 and 2015, as it is also a marijuana friendly State. This means that not only cannabis related businesses are getting more clients, but that other businesses are doing so too. Businesses like travelling companies, airplane companies, car rental companies, hotels, restaurants and more, all benefit from the people who visit these States to try some cannabis and this means more income for everyone. 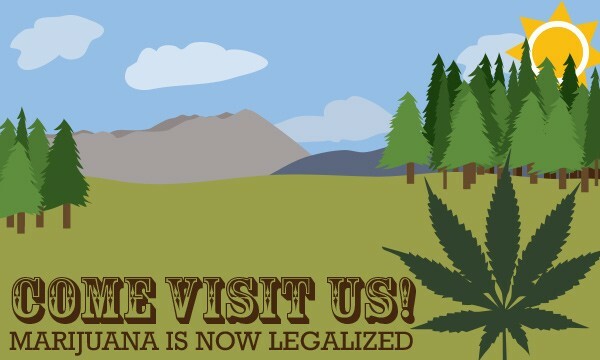 This is definitely a good thing and since these States now offer both medical cannabis and recreational marijuana, there are many reasons for people to want to travel to these places. It is only a matter of time, until the rest of the world understand the importance of allowing this herb in their territories, as the current laws on cannabis, have not yielded any positive results. It is time to allow marijuana everywhere and let cannabis tourism grow. Many people will benefit from this and ending the war on cannabis will also allow people everywhere, to live a happier life. Please remember to share and like this blog post, so that more people can read about marijuana tourism and how it is going to become one of the most important side industries, when cannabis is legalized.